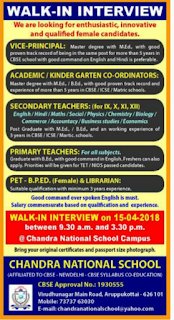 Chandra National School, Aruppukottai has advertised in DINAMALAR newspaper for recruitment of VicePrincipal,PGT,TGT jobs vacancies. Interested and eligible job aspirants are requested to walk-in 15/04/18. Check out further more details below. Name of the School: Chandra National School, Aruppukottai. About School:Chandra National School is located just 4 kilometers from Aruppukottai town towards Virudhunagar highway road; sprawling in 6.5 acres of land. This peaceful & Eco-friendly campus away from the din and bustle of city life provides an ideal environment to foster creativity and individualistic thinking in the students. The School is co-educational and the campus is beautifully landscaped with lush green gardens. The School has its own reputation for its excellent infrastructure and facilities. Presently, there are classes from Kindergarten (starting at Age 3 onwards) to Standard X which will grow vertically each year. Classes from LKG to Grade X will be functioning in CNS campus.Pre- School will function in Chandra Chutty School situated in heart of Aruppukottai town. 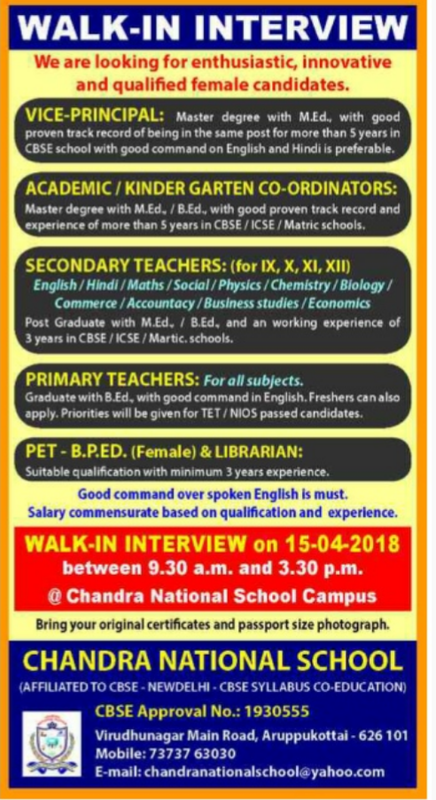 (a) Vice Principal: Master degree with M.Ed with good proven track record of being in the same post for more than 5 years experience in CBSE school with good command on English and Hindi Preferable. (b) Kindergarten co-ordinators: Master degree with M.Ed /B.Ed with good proven track record and experience of more than 5 years CBSE/ICSE/Matric Schools. (c) Secondary Teachers: Post graduate with M.Ed/B.Ed and an working experience of 3 years CBSE/ICSE/Matric Schools. (d) Primary Teachers: Graduate with B.Ed good command in English.Freshers can also apply. Priorities will be given for TET/NIOS passed candidates. (e)PET -B.P.ED (Female) & Librarian: Suitable qualification with 3 years of experience. @ chandra national school campus. Bring your original certificates and passport size photo.